Winds of the South, great serpent, thank you for your presence here. Winds of the West, Jaguar, thank you for the teachings you bring. Winds of the North, rhymes, rhythms, patterns, ancestors and descendants, thank you for being with us. Winds of the East, details and grand overview, thank you for the light to see by. Sweet Mother Earth, we inhale your breath, we drink your blood, we eat your flesh, we – your children give thanks. Father Sky, we stand in awe and reverence of your great mystery. Magician Space is proud to present a second solo exhibition for artist Timur Si-Qin. In this show, New York-based German artist Timur Si-Qin continues his development of New Peace, a secular spirituality for the 21st century. Identifying the dualistic legacy of agricultural society and religions as maladaptive for our contemporary world, New Peace argues for a re-enchantment with matter as the necessary basis for confronting the material problems of our times. 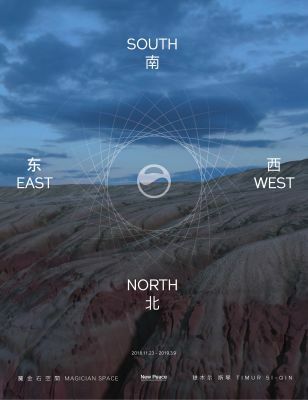 The title East, South, West, North is a reference to the sacred circle of the four directions, a primary spiritual concept in pre-agrarian/hunter gatherer religions of Central Asia and North America. With this Si-Qin signals both a return to and necessary upgrade of our spiritual orientation and dimensionality. In the white paper for New Peace entitled A New Protocol, the artist points out that religions are themselves technologies of belief. Protocols for human behavior towards one another and their environments. However today the spiritual vs material dualism inherent to agricultural society and religion has become a maladaptive constraint that prevents us from adequately conceptualizing our connection to, and impact on, the non-human world. The response is a new secular spirituality of matter and an elucidation of a non-human ethics of difference. Influenced by currents of New Materialist philosophy that challenge the anthropocentric privileging of the human subject since the beginning of his practice, Si-Qin seeks a spiritual and intellectual reconceptualization in which the material is recognized for its inherent dynamism and creative potentiality. A plane of immanence on which animals, plants and other organisms are recognized as being connected to and on equal ontological footing with the human. In many ways resembling the cosmologies of pre-agrarian cosmologies. In this “radical immanence”, when the interconnected oneness of reality is recognized, the fractal patterning, movement, and infinite creativity of matter are elevated to the sacred. Within “infinite difference”, the ceaseless variation and differentiation of matter attests to an irreducible and open ended universe. New Peace breaks with the illusion of the separation between human and nature, but it also provides a new channel for appropriate reflection on and effective intervention in the reality of the world, such as climate change and retrogressive political life. The ritual practice of New Peace, like a sacred circle, draws on many different patterns, whether artworks or physical architecture on the earth. In the exhibition, a group of all-new sculpture works made of crab, insect, shell, tree, and other beings the artist had encountered and 3d scanned become the agents and participants of a new ritual and space of worship. Here, the artist attempts to awaken an older animal power, tracing the relationship between human and animal back to a more primal connection. This move is echoed by digitally rendered landscapes in lightboxes and VR, which further point towards the dissolution of the nature/culture divide. The dialogue between the artist and a diverse array of materials, whether stones, lighted advertisements, digital images, or machines, is not only limited to aesthetic forms and considerations, but on a deeper level, this dialogue advocates for the independent, open consideration of culture as an emergent manifestation of matter. As various outmoded boundaries wear away, a collapse of the dualities of nature and culture, synthetic and organic, subject and object precipitates the question of how should art reconstruct subjectivity, consciousness, and morality within the material? New Peace is Si-Qin’s attempt to provide a potential path and personal resources for humanity to re-orient itself in an age of cataclysmic change. Timur Si-Qin (b. 1984) is an artist of German and Mongolian-Chinese descent who grew up in Berlin, Beijing and in a Native Indian community in the American Southwest. Growing up in a multi-cultural environment helped inform Si-Qin’s unique sensitivity to the relationship between nature and culture. Now living in New York, Si-Qin has become a leading figure in a Post-internet generation of artists who reference new developments in science and technology to challenge the separation between the human world and the biological laws of the natural world. Exhibitions include major solo shows at: Magician Space, Beijing (2018/2015); Spazio Maiocchi, Milan (2018); Société, Berlin (2018/2015/2013/2011); Art Basel Hong Kong (2018); Konfuzius Institut, Berlin (2017); Team Gallery, Los Angeles (2016); Art Basel Statements, Basel (2016). He also participated in the 9th Berlin Biennale in 2016.